After a busy couple of weeks in the robotics components product announcement space, we only had a few news announcements of note, including a new direct drive motor from Mitsubishi, and an LVDT signal conditioner with tampering protection from Alliance Sensors Group. Mitsubishi Electric Automation this week announced a new Low-Profile Direct Drive Motor (TM-RG2M / TM-RU2M), aimed at machine designers and end users looking for direct control of a load without traditional transmission components. “Built with speed and precision in mind, it provides a smaller footprint and allows for more compact, efficient, and precise machines than those typically built using rotary servo motors,” Mitsubishi said in a statement. 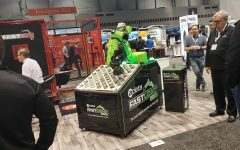 Applications that can use the new motor include coating and vapor deposition systems, index tables, tool changers, rotary material handling robots, and rotary axis on XYθ inspection positioning systems, the company said. Additional details on the motor can be found here. In addition, the signal conditioning module features cybersecurity tamper prevention and notification features that alert system operations of tamper attempts. The company said the S2A features more system diagnostic capabilities than any stand-alone LVDT conditioner on the market, with the ability to detect at least 11 fault conditions. Its push-button calibration can reduce setup time by a factor of 10, and the internal microprocessor automatically sets up the LVDT signal conditioner. It can also be set up remotely via an RS-485 port connection. For installations involving multiple position sensors, the S2As can be master/slaved to prevent cross talk between sensor signals, the company added. The S2A can be used in steam valve position feedback, governor and throttle valves, interceptor and stop valves, boiler feedwater pumps, and turbine control systems. For more details on the new S2A AC-LVDT Signal Conditioner, visit the Alliance Sensors Group website. And LORD Sensing, which announced the new EVO design platform-driven LS Series of pressure transducers and transmitters, delivering high performance configurations in a standard solution.